In her recent customer experience blog (http://bit.ly/nQLkK5), Forrester Analyst Kerry Bodine points out that many executives have tunnel vision. She says, “Many organizations place too much emphasis on top-of-mind channels such as the Web and social media, ignoring hundreds of touchpoints that influence customers’ perceptions of the brand… but in reality, behind-the-scenes employees from departments as diverse as finance, legal, and marketing can play an equal or even greater role in determining the nature of customer interactions.” In fact, it turns out that the employees handling these routine customer interactions know a lot about what customers want – but they may not be telling you. 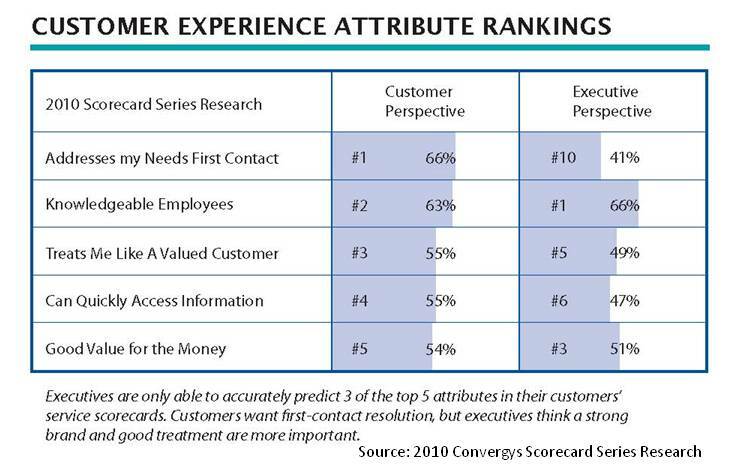 The customer experience research I directed last year (http://bit.ly/oDzXg8) showed that, in general, employees are better than management at identifying the service attributes and channel preferences that are most important to customers. Generally speaking, the closer they are to the frontline, the more able employees are to identify the right attributes. Whereas just 51% of senior management can identify 3 out of the 5 top attributes, employees in general are consistently able to identify 4 of the top 5 attributes for customers. Front-line staff and supervisory associates are the best at correctly identifying customer requirements – more than 70% can correctly identify 3 or the top 5 attributes. Employees are also more accurate at predicting the number of customers having bad experiences, whether or not those customers will report them to the company, and whether or not they will defect. More than half of employees think that customers are having bad experiences with their company, and 57% of customers say that is the case. 65% of employees think that customers typically report their bad experiences to the company, and 66% of customers do. 95% of employees believe that customers that have a bad experience typically tell friends or colleagues about it, and at least 80% of customers say that they talk or post. 69% of employees think that customers that have a bad experience typically stop doing business with the company, and 59% of customers actually defected or plan to as soon as their contracts are up. If employees know all this, why don’t they tell you? You’re Too Busy/Important: Employees may not feel empowered to communicate their knowledge upwards. They may think you wouldn’t listen or act anyway. Does your company have an established communications channel that employees can use to communicate with you? You’re Too Far Away: Senior executives are simply the furthest from the customer in the organization. Although senior executives spend time meeting with executives at client companies and talking to key accounts, they are not dealing with individual customer problems on a day-to-day basis. Are you taking time to get “in the trenches”? You Aren’t Social: The social media channels increasingly used to interact with customers may not be your cup-of-tea, but they are full of real-time information. How often do you check Twitter to see what your customers are talking about? You Know It All: Executives get lots of information, and often have loads of customer analytics data at hand. Still, they may have to fight the assumption that the things that motivate them are the same things that motivate customers—an assumption that demographic changes are making less and less accurate. You may know a lot, but can you afford to stop learning? As Kerry Bodine concludes, with an “incomplete picture, organizations are set up to fail when it comes to designing the right customer experience for their customers.” Executives have to fight to see the forest for the trees. The very large and very real changes taking place require new techniques and mind-sets. Make sure employees at all levels know that it’s appropriate and encouraged to escalate information. Give them channels to do so internally, and spend time surfing the social media channels that your employees and customers frequent. Most importantly, remember that communication is a two-way street. It turns out that employees, especially front-line staff, understand a lot about what motivates, concerns and delights your customers. That information is too valuable to risk tunnel vision. This entry was posted in Customer Behavior, Customer Experience, Customer Experience Research and tagged Customer Experience, Customer Experience Research, Customer Service, Employee Experience. Bookmark the permalink. I just read your recent blog post about “What Your Employees Aren’t Telling You,” and I enjoyed it. You captured a true aspect of modern-day business, and hopefully, as the economy improves, top leaders will gain a better understanding about the value of their employees and their knowledge base.